Mehendi is actually a paste that is created from the powdered henna, turmeric and some other natural objects. It is mostly used to decorate the hands and the feet of the brides and considered as the most important pre-wedding ritual, in case of Indian marriages. This tradition is an ancient one, as the word 'mehendi' is derived from the Sanskrit word 'Mendhika' and it is mentioned in the Hindu Vedic texts, the most ancient religious scripts of India. Usually mehendi is stuffed into a cone and various artistic designs are made with that cone, over the hands and feet. The brilliant reddish color of the mehendi is seen only when the paste dries off and washed away from the skin. The Indian women also wear mehendi designs on several religious and social occasions, apart from their own marriages. 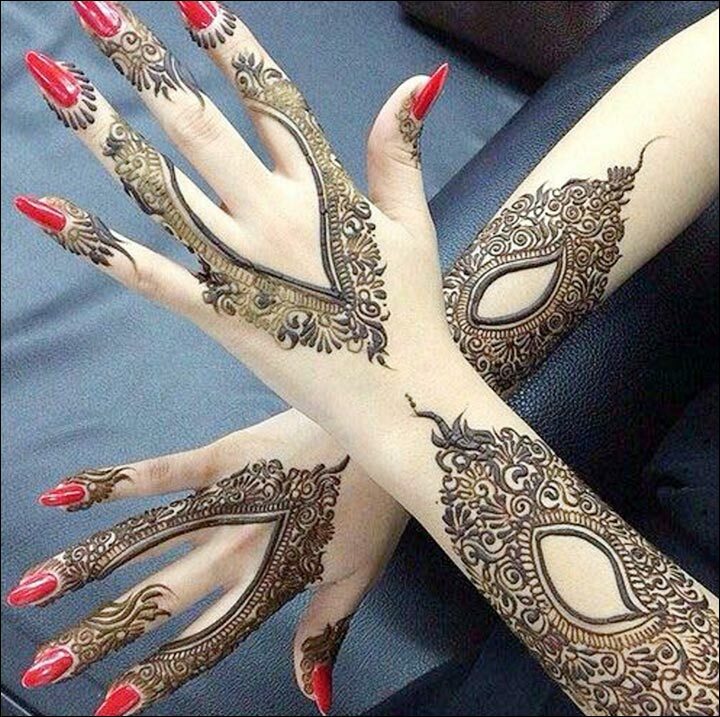 There are several professional mehendi artists, who have numerous designs in their stocks. Like all the rituals of the Indian weddings, Mehendi ceremony is also very important for an Indian bride and it is celebrated by all Hindus and Muslims of Indian subcontinent. Hence, the relatives and friends are invited to join this celebration. So, various entertaining options are arranged for these guests as well as for the enjoyment of the bride and her family members. Dress of the bride – The brides generally wear new ethnic dresses for this occasion, mostly in bright colors, like hot pink, chrome yellow or deep purple colors, decorated lavishly with rich embroideries. The other girls of the family and the friends of the bride are also seen to be wearing similarly gorgeous Indian attires on this occasion, as they also décor their hands with mehendi, once the bride has completed doing it. Games played during mehendi - Usually, the name or the initials of the name of the groom are hidden inside the design of the mehendi, done on the hands of the bride. The groom is supposed to find out his own name or initials from that design. The groom often needs to identify the hands of his bride, without looking at her face, when many mehendi adorned hands of several women are kept hidden below the holes of a sheet. Several other fun games are also played by the friends and sisters of the bride on this occasion. Other entertaining activities - The invited ladies can also further beautify themselves by joining the hired Nail artists, tattoo artists or the bangle makers, all of whom can help in making them look more gorgeous and colorful. Several delicious foods are also served to keep the guests happily engaged during this mehendi ritual. Now, the wedding guests are cordially invited to join the Mehendi function of the wedding, by the bride’s family, by sending them the digital wedding cards, prepared by the reputed online card designers.